Mangaluru, Oct 14,2017 : Students of Dr MV Shetty College of Social Work staged a street play at Kavoor Junction on October 14, Saturday as part of World Mental Health Day. 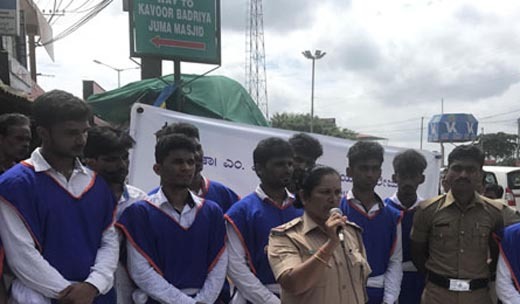 Professor of Social Work Department Preethi who spoke on the occasion said the street play has been organised as part of a social awareness drive of the institution. Rosamma, Police Officer from Kavoor Station was all praise for the students said one should take all problems in life as a challenge instead of getting bogged down. Prakash Amin, Associate Professor, Rajashekhar, Police Officer of Kavoor Station and many others were present.